This walk: 2015-4-15. Four Winds, King's Tor, Great Mis Tor, Little Mis Tor, Cave, Sugar Lump Pile. Ordnance Survey, Six-inch to the mile, 1884 - no sign of any school. Ordnance Survey, Six-inch to the mile, 1st edition - 1888-1913 - Great Mis is centred at the top of the page and the road is at the bottom. There is no Four Winds on this map, the School is seen at the right, west of Rendlestone. Previous walk in this area: 15th April 2009. Most of the photographs below were taken on a "recce" on Easter Monday, 6th April, early in the morning when there no-one else seen except two runners and later a family of four people making their way up the track at 10.50 am as I reached the car park coming back - I was alone for the glorious, cloudless, blue sky morning! It was much the same on our walk, except that we all had good company. Inside the Four Winds car park area - this was the site of Foggintor School, built in 1914, having about 55 children from the local quarries. It was closed in 1936, becoming a private house thereafter aptly called Four Winds. It was finally demolished in 1965. Before the school was built, Foggintor Mission Hall was used. While it was a school, with just the one headmaster, Fred Stoyle, who was the youngest headmaster in the country, it had a garden with bees, poultry, goats and rabbits. His wife, Mrs. Stoyle, taught the younger children. The children played football on a moorland pitch and warmed their pasties on central heating pipes! The Stoyles' son, Ivan, took the school Christmas tree into the garden in 1924 and planted it, this is the tree you see today - in this photograph! Longash Leat, at the rear of Four Winds, with a small clapper bridge. On the military track to Great Mis Tor, looking back at Four Winds and King's Tor: Peek Hill is seen above the trees and Leeden Tor at the extreme left. There's obviously something interesting over there! Looking up thr military track to Great Mis Tor, with Little Mis Tor over to the right. Zoomed view to Great Mis Tor. Great Mis Tor with Little Mis Tor (at right). Little Mis Tor Cross ...... a memorial to Chris Swanson, a Dartmoor guide, Duke of Edinburgh Award Scheme assessor, keen hill walker and a shipwright in Devonport Dockyard. He died following a fall from a ship's mast while at work. His ashes were to be scattered at his favourite tor, Great Mis, but on the day, the weather was so bad that the party, which included a vicar, had to stop and shelter in the lee of Little Mis Tor. It was here that the ashes were scattered and a granite plaque was fixed later to the tor by four deep-set bolts. The plaque disappeared after a few weeks, discovered by friends who came to lay flowers in the crevice above the plaque. The four bolt holes are still visible and sometime later, the rock face was inscribed. Source: Dartmoor News, Issue 124 Jan/Feb 2012, page 6. Recounting the story of the memorial. The Forest of Dartmoor boundary stone, at SX 56339 76778. King's Tor, with some trees at Four Winds at extreme left. A useful shelter in bad weather. Having taken the photo, I'm not wasting it! Great Mistor pan, at SX 56267 76932, a worn depression in the rock: the lip on the right was vandalised many years ago. This photograph is from a previous walk (2nd November 2011) because the wind was too strong today to risk climbing to the top on the "recce". Just another group photograph on a beautiful day. Another photographic favourite - seen below in silhouette (3rd photograph below, taken into the sun). The famous Great Mis Tor Sugar Lump Stack, SX 56150 76972. Silhouette of the central rock pile of Great Mis Tor, the rock pan is on the top-most "flat" rock just left of centre. Looking west from Great Mis Tor, with Great Staple Tor (left, SX 542 760, elevation 455 metres / 1492 feet), Roos Tor (right, SX 543 766, elevation 454 metres / 1489 feet) and Cox Tor (right of centre, behind, SX 530 761, elevation 442 metres / 1450 feet). The Range Clearing Officer's stable for their pony, with the observation hut behind. A third marker post "may" be seen on the horizon, just right of the second marker. Ditto, showing the corrugated Wesleyan chapel, now a listed building. Final view of the Mis Tors. © Crown copyright and database rights 2015. Ordnance Survey Licence number 100047373. Use of this data is subject to terms and conditions. There is an apparent double peak because I went twice to the flagpole area. The twin peaks are at 537 metres (1761 feet). The map shows 538 metres at the highest point (1765 feet) as the height of the tor. The altitude of the car park is 369 metres (1210 feet), therefore we ascended 168 metres (551 feet). 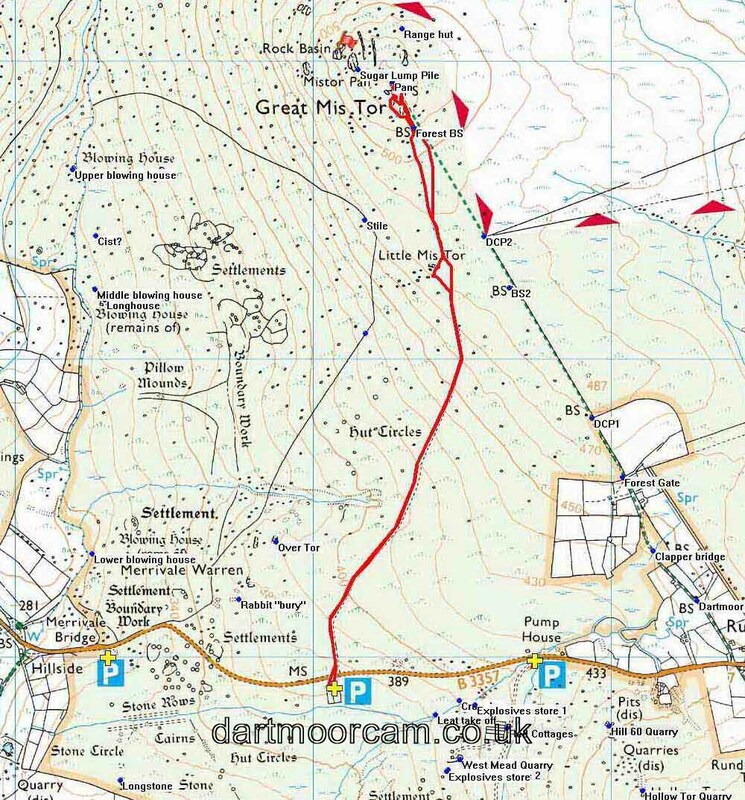 This walk was accessed by parking at Four Winds (SX 560 748) on the B3357, south of Great Mis Tor, on the Tavistock - Two Bridges road, marked by the P symbol and the centre yellow cross on the map. Distance - 5.19 km / 3.23 miles.